Do Your Car Keys Weigh Too Much? 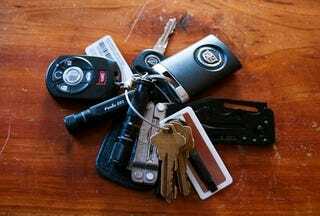 Keychains are a great way to organize all the little things you need in day-to-day life, but adding too much to yours could damage your ignition and prevent you from starting your car. How much is too much? Probably less than you might think. Car Talk's Click and Clack suggest limiting your load to 9 keys or less, but we've heard that 3 Lbs is often the weight ignitions are designed to bear without undue wear. Why is weight bad for your ignition? The weighted key will put stress on the tumblers, particularly as the car bounces and shakes down the road, causing them to wear irregularly and eventually fail. A worn tumbler doesn't engage the locking mechanism in the precise way necessary, meaning your key will no longer be able to turn the lock. To prevent long-term wear on our ignitions, we separate our car keys from our general key chains, leaving just the car key and key fob to place as little load as possible on the ignition. Now you know, and knowing is half the battle.